The artificial intelligence sector has experienced explosive funding growth in recent years. This blog post examines the different components of the AI sector and how they make up this startup ecosystem. We will illustrate what the categories of innovation are and which categories have the most companies. We will also compare the categories in terms of their funding and maturity. Let’s start off by looking at the Sector Map. 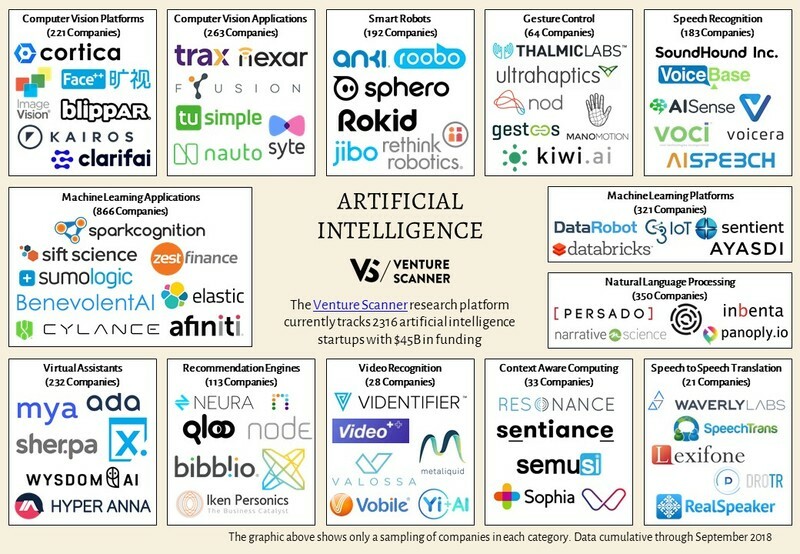 We have classified 2,316 artificial intelligence startups into 13 categories that have raised $45 billion. The Sector Map highlights the number of companies in each category. It also shows a random sampling of companies in each category. We see that Machine Learning Applications is the largest category with 866 companies. These companies utilize self-learning algorithms to optimize business operations in vertically specific use cases. Examples include using machine learning to detect banking fraud or to identify relevant sales leads. Some example companies are Sift Science, SparkCognition, Sumo Logic, and BenevolentAI. Our Innovation Quadrant divides the artificial intelligence categories into four different quadrants. 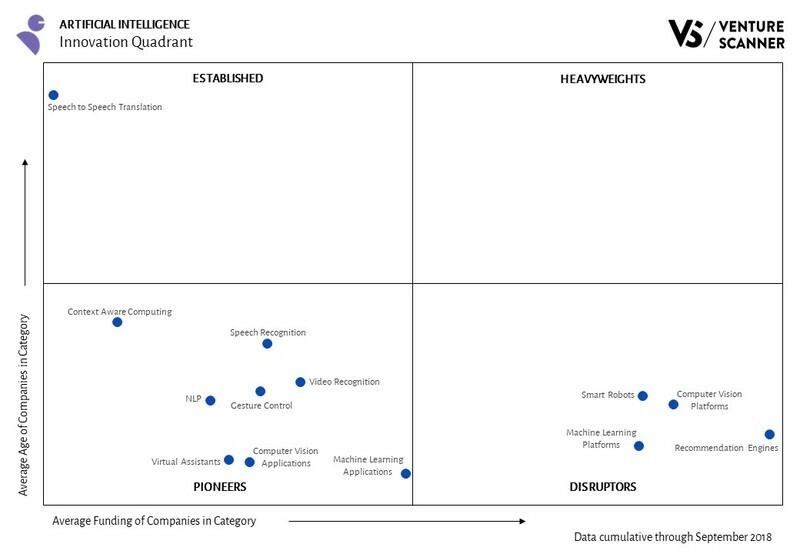 We see that the Pioneers quadrant has the most artificial intelligence categories with 8. These categories are in the earlier stages of funding and maturity. The Disruptors quadrant has 4 categories that have acquired significant financing at a young age. The Established quadrant has Speech to Speech Translation as its one category. This category has reached maturity with less-than-average financing. We've analyzed the artificial intelligence categories and their relative stages of innovation. Let’s now look at how they stack up against one another in terms of their total funding versus company counts. As the above graphic implies, Machine Learning Applications also leads the sector in total funding with $19 billion. Its funding is more than twice the funding of the next category, Machine Learning Platforms with $9 billion. These two categories are related yet have different functions. Machine Learning Application companies apply self-learning algorithms to optimize specific business operations. Machine Learning Platform companies build these self-learning algorithms or their underlying infrastructure. 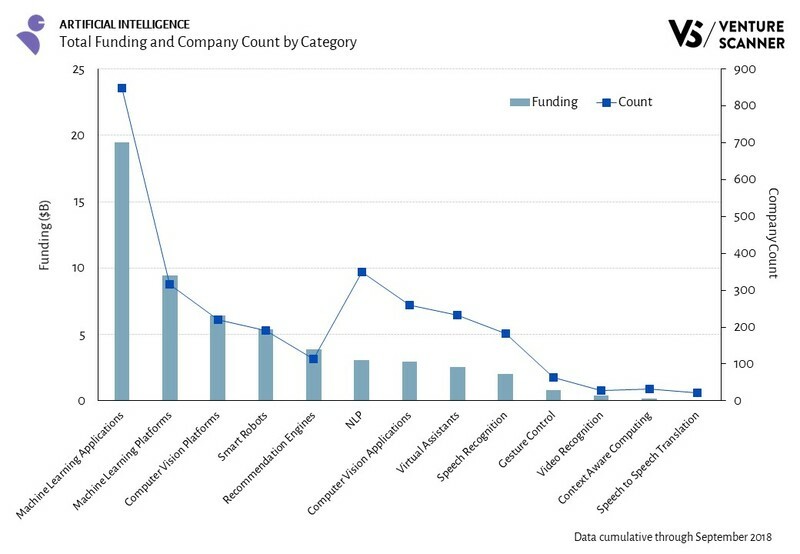 As the analysis above demonstrates, the Machine Learning Applications category leads in total companies and funding. We'll see if any of the other categories catch up during the rest of 2018.